Enjoy one of the Buffalo Bill Center of the West’s most popular and dynamic programs: the Draper Museum Raptor Experience. 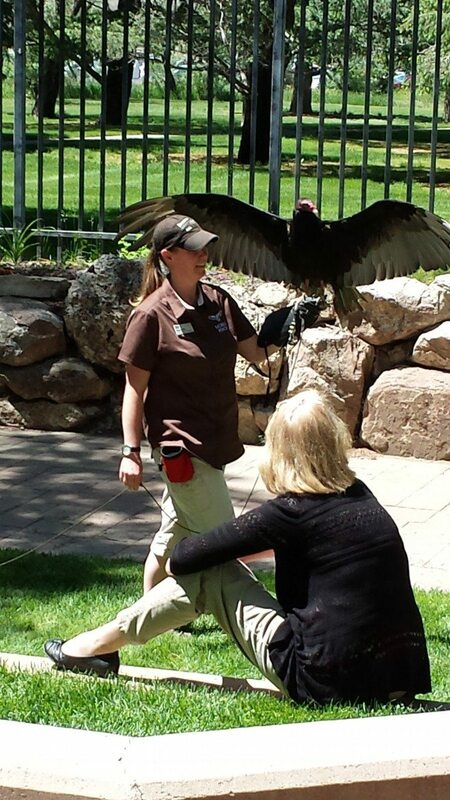 Turkey vulture Suli, one of our raptors, during a program. At 1 p.m. each day the Center is open to the public, staff and volunteers bring out a few of the Raptor Experience’s live birds in the Center’s beautiful sculpture gardens (or in the Hub—the Center’s main lobby—in case of inclement weather). They talk about the raptors and the program, and answer questions from the audience. Click here for the Raptor Experience’s blog! Find out more about the Draper Museum Raptor Experience.